"This is one of Point Arena's most important houses. In a town of simple, functional dwellings, it earns note as the only example of the Queen Anne style. 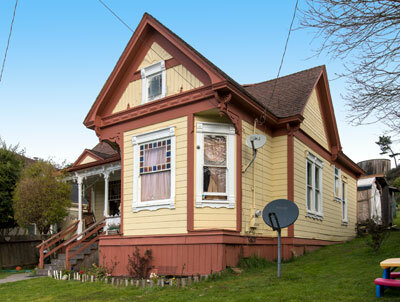 The Queen Anne - especially in the single-story cottage form - was extremely popular in California during the 1890s. Because of the widespread use of published building plans and the easy availability of pre-cut detailing, houses that looked almost identical to this one were built throughout the state. Rather than featuring an unusual plan, the Queen Anne cottage was defined by a dramatic bay window beneath the front-facing gable and a seemingly unrestrained use of ornamentation on all elevations. This house clearly exemplifies both characteristics. The bay window projects straight out toward the street. Fancy moldings surround the windows, the middle of which has one sash with leaded glass. In the pedimented gable end above a group of decorative elements is symmetrically composed. The rest of the building is similarly ornamented. At the cornice of the porch roof, for example, are decorative brackets and a dentil course with pendants. The porch steps and balustrade are not original, but they detract very little from the integrity of the building. It meets the registration requirements for its property type."